Spring is such a beautiful time. It represents awakening, renewal, and life. Where once lay a dormant seed, life and beauty begin to spring forth. A seemingly simple seed is such a profound visual for understanding the power of God’s word in our lives. A seed unplanted doesn’t provide much inspiration or beauty. But, when that little seed is planted deeply into fertile ground, watered, cared for, allowed to have light shine upon it, and waited for patiently, gives birth to breathtaking beauty and nourishing fruit. It transforms barren landscapes into glorious panoramas. The Word of God refers to itself as a “seed” more than 40 times in the New Testament. Why? Because the Lord understands that we can imagine the process a seed goes through, we can observe it because He gave us a real-life, visual understanding of it. Just like a flower seed, the Word of God must be planted in our fertile hearts, fed and cared for, spoken for light to expose darkness, and persistently and patiently pursued to produce the fruit and beauty we desire in our lives. In Mark, Jesus taught three parables about this very concept. The word of God is to our experience of God and His plan for our lives what a physical seed is to spring blossoms and rich harvests. Unfortunately, lies can also be planted and produce fruit. What we feed grows. If somewhere along the way in our lives, a lie is accepted as truth, planted and fed, it produces fruit of doubt, anxiety, fear, anger, etc. The good news is that those lies can be plucked by the root and replaced with seeds of truth! As you enjoy the physical splendor of spring, I’m inviting you to begin preparing the soil of your heart for awakening and renewal as well. We can experience a true spring in our spirits by digging up the weeds that entangle us and begin to replace them with the beautiful bouquet that comes from planting God’s truth into our lives. 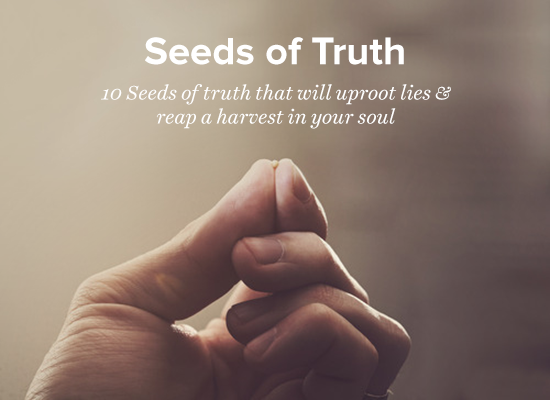 Beginning April 1st, I invite you to join the Facebook Group "Renewing Your Mind with Seeds of Truth", where there will be daily posts with some of the most common lies we accept as truth. Accompanying this will be your opportunity to dig up that lie and replace it with truth. To replace each common lie, there will be a scripture to declare over yourself as you plant new seeds of truth in your heart. There will be a printable version of every post so you can print and post God’s word to be seen and declared over and over. Remember, a seed doesn’t blossom into a daisy in a day, and neither does replacing truth for lies. But, keep declaring them over yourself and you will reap a rich harvest! It’s not just my promise, it’s God promise!! !